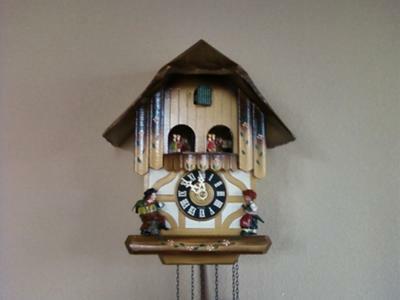 I would like to know the age of my newly purchased Cuckoo clock. Many sites out there give good info on how to find out the date that your clock was made. However, it is not a simple task. I have conflicting information as to what the stamps on the clockwork means. Brahms Lullaby paper sticker attached to the back of the house/chalet. Three pine cone weights, one stamped with a "19", one with a "5", one with a "16" (however they all are same size and seem to weigh the same!) Stamps on these are not very clear to read.